The Hui are an official minority of China. Their high cheekbones and round eyes give many Hui a very different appearance from the Han Chinese. The Hui speak standard Mandarin; although, in some locations, Persian and Arabic words have been added to their vocabulary. By the middle of the seventh century, Arab and Persian traders and merchants traveled to China in search of riches. In addition, in the thirteenth century the Mongols turned people into mobile armies during their Central Asian conquests and sent them to China. These civilians were expected to settle down at various locations to farm while maintaining combat readiness. As artisans, scholars, officials, and religious leaders, they spread throughout China. These people are the ancestors of today's Hui. One of the worst cases of genocide in history took place against the Hui in Yunnan from 1855 to 1873. One million Hui people were massacred. The Hui are forbidden to eat pork, but that prohibition is often overlooked by calling the meat "mutton." A Chinese joke is that "One Muslim traveling will grow fat; two on a journey will grow thin." The Hui are renowned as sharp businessmen. A Chinese proverb from the 1800s states, "A Chinese awake is not the equal of a Hui sleeping." Almost all Hui are Sunni Muslims. 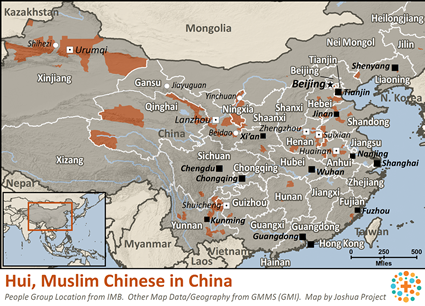 They worship in thousands of mosques throughout China. 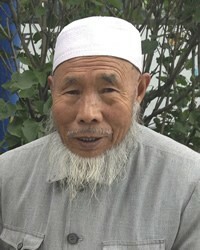 Islam first came to China via Abu Waggas, one of Mohammed's contemporaries. He preached in southern China and had the Beacon Tower built in memory of Mohammed in AD 627. In recent years, an increasing number of Hui have traveled to Mecca for the annual Haj pilgrimage. Mission work among the Hui in Ningxia commenced in 1885. A few Hui converts were numbered among the Hui in Manchuria, Gansu, and Qinghai by the 1920s. In 1934 an American missionary known as Hai Chun Sheng baptized several Hui Muslim leaders in Qinghai. Recently a mission team secretly distributed 35,000 gospel tracts and cassette tapes to the Hui. A large church has emerged in northern Ningxia, but almost all the believers are Han Chinese, and few of them have a desire to reach out to the Hui. Most Hui have yet to hear the gospel of Christ, but there are now a few thriving churches among the Hui. View Hui in all countries. 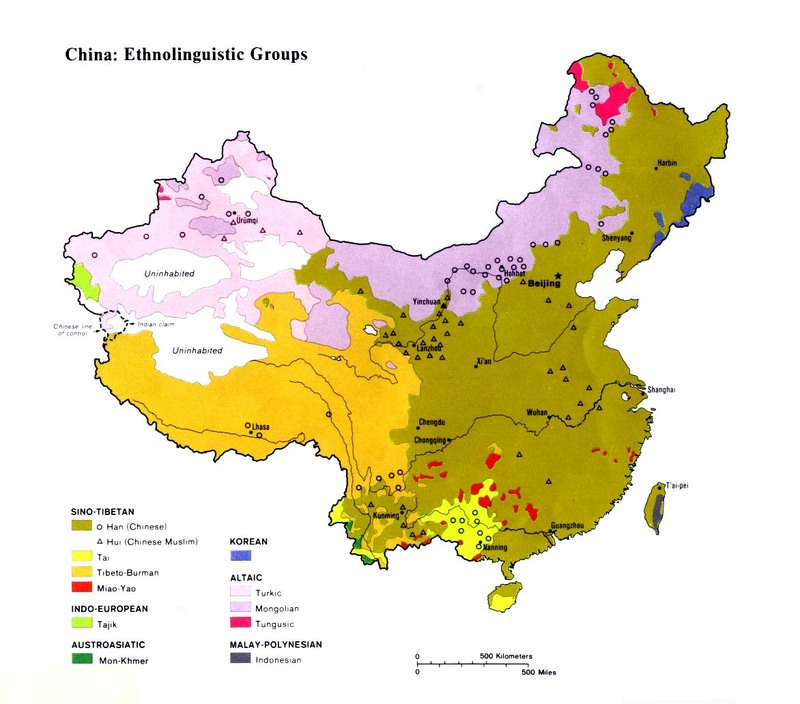 Location in Country: The Hui are the third largest minority group in China. Approximately 10.6 million Hui live scattered throughout almost every part of China. Remarkably, Hui reportedly live in 2,310 of the 2,369 counties and municipalities in China. More than 200,000 Hui also live in the surrounding countries of Myanmar, Taiwan, Kyrgyzstan, Kazakstan, Mongolia, and Thailand. In these countries they are known by different names, including Dungan, Panthay, and Khotan. The majority of Hui in China inhabit the Ningxia Hui Autonomous Region, a barren wasteland established in 1958 in north central China.